Forty-fourth President of United States on Wednesday (Phl Time) creates another history aside from being the first re-elected president from the black race. Barack Obama's winning moment strongly marks online world as biggest stuff for 2012. His tweet "Four more years" is considered the most retweeted in the history of Twitter, 648, 813 times as of this writing. 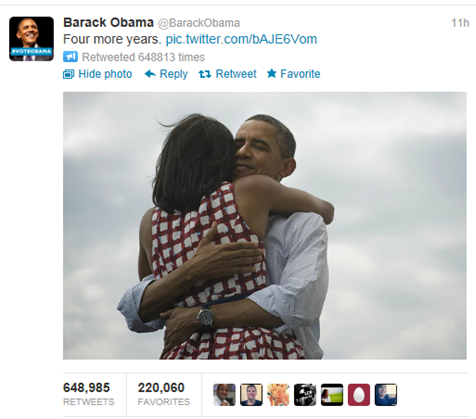 Photo: Barack Obama's famous tweet "Four more years"
With over 220,000 favorites and still counting, the world supports the democrat and happy for his victory. The photo attached on his tweet shows deep expression of love and excitement as his wife, Michelle Obama represents his beloved country. His tweet surpassed the record of Canadian superstar Justin Bieber with tweet "RIP Avalanna. i love you" which only got 223,402 retweets and 100,606 favorites as of this time. The role of social media really have great impact for his winning against Republican Mitt Romney. His campaign using Twitter did a lot to relay his messages and platforms online.